In search of some hot tracks to amp up your summer fun? 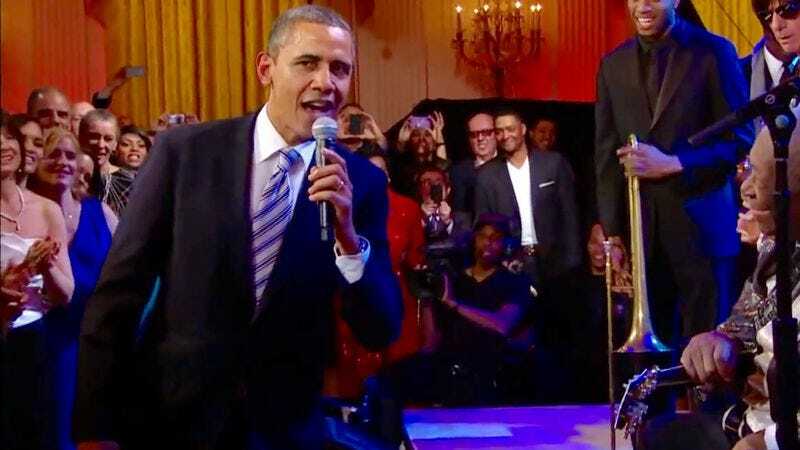 Well, look no further, because DJ Barack Obama has got your back. Earlier this morning, the White House unveiled two different playlists on Spotify of the President’s favored summer tunes. One has been curated for the daytime, presumably to listen to while you work on your short game at the course in Martha’s Vineyard, and one for the night, which should help you get through that 52 hours of self-assigned reading. Being a 53-year-old man and a noted fan of Al Green, the playlists are both naturally dominated by old-school jazz and soul songs like “You Don’t Know Me,” by Ray Charles, “Another Star,” by Stevie Wonder, “Flamenco Sketches,” by Miles Davis, and of course, “Hot Fun in the Summertime,” by Sly and the Family Stone. But just to show he’s also down with the kids of today, he’s thrown in some selections by 21st century acts like Florence + The Machine, Coldplay, and—of course—Beyoncé. There’s also an Okkervil River track mixed in there, “Down Down the River Deep,” just to bump up his indie cred. Take that, Mitch McConnell!